Sunrise Capsules is unique blend of internationally acknowledged berries & other health giving nutrients which are internationally recognized to detox, cleanses & maintain overall health. This product is 100% natural & glorious HALAL & Kosher certification recipient also have been produced under International GMP guidelines. 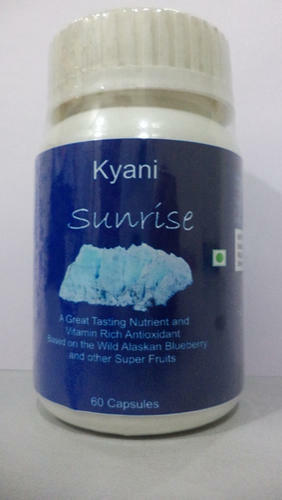 We have manufactured Sunrise Capsules with 100% pure extract of Alaskan Blueberries giving your energetic feeling & amazing health benefits. Sunset Capsule is very effective products first time launched in India in joint venture with Hawaiian Herbals, Hawaii, USA derived from wild Alaskan fish oil which is highly rich in fiber and omega-3 fatty acids, which have beneficial physiological effects. It is considered to be a super food, This product is HALAL & Kosher certified and has been produced under international GMP guidelines. It is a cardio tonic thus providing nutrition to heart muscles and strengthening them. The consumption of optimum Omega 3 is associated with a reduction in total cholesterol, including the LDL (bad) cholesterol and triglycerides. Study after study has shown a positive response to taking this product daily. It normalizes the distributed rhythms of heart. It provides a significant cardiac protection in myocardial infarction commonly known as heart attack. It helps in lowering cholesterol levels and maintaining it to normal levels. Perilla Oil is based on purely natural bio active formula. This unique product is launched from Hawaiian Herbals, Hawaii, USA possess lots of health benefits. This is also HALAL & Kosher certified product and has been produced under GMP guidelines. We all know Perilla Seed Oil which is known to control the secretion of EPA (Eicosa Pentanoic Acid) and DHA (Decosa Hexaenoic Acid) which are important Omega - 3 Fatty acids in the body and maintains basic heart health and vision quality with nourishing effects on retinal cells. Neem Capsules is manufactured in technical collaboration with Hawaiian Herbals, Hawaii, USA. This is HALAL & Kosher certified product which has been produced under International GMP guidelines. Traditionally Neem has been used against a wide variety of diseases Neem has been used in the Ayurvedic tradition for thousands of years for maintaining health and overall well-being. Kai Neem Capsule contains anti bacterial, anti septic, anti diabetic, anti fungal and blood purifying properties. Grape Seed Capsules is one of the most popular nutritional products in the world, and is launched in technical collaboration with Hawaiian herbals, Hawaii, USA. This is HALAL & Kosher acclaimed product and produced under GMP guidelines. Grape Seed Extract is a potent holistic extract from premier American grapes. This unique product is combination of vitamins A, C, B6 and folate in addition to essential minerals like potassium, calcium, iron, phosphorus, magnesium and selenium. Bee Propolis is generally known to be effective at treating infections and soothing pain, and has antimicrobial and antibacterial properties. Propolis is used on serious cuts, bruises, sore throats, stomach complaints, and athlete’s foot besides possess powerful anti oxidant properties. When used regularly, propolis can help with chronic health problems and persistent allergies. We have brought first time in India manufactured by Hawaiian Herbals, Hawaii, USA. This is 100% natural product & has been produced under international GMP guidelines. Acai Plus Capsules is manufactured in technical collaboration with Hawaiian Herbals, Hawaii, USA. It is a HALAL & KOSHER certified product which has been produced under International GMP guidelines. It is 100% natural & safe being a unique product with natural antioxidants. Acai Plus Capsules is formulated with 21 fruits, including the Super fruit Acai berry which will help the human body nutritionally to have a strong immune system & promote healthy cell growth. It may help in balancing all essential nutrition and provide body vitality for energy throughout the day and hence prevents from various dreadful diseases for a long and healthy life. Ulcer Care Capsules are launched in technical collaboration with Hawaiian herbals, Hawaii, USA. This is HALAL & Kosher acclaimed product and produced under GMP guidelines. This product helps in relieving the irritation so that healing is able to progress naturally. It suppresses mild symptoms resembling heartburn or severe pain radiating throughout the upper portion of the body. This is natural way to get rid of painful ulcers. Omega 3 Capsules is a dietary product manufactured in technical collaboration with Hawaiian Herbals, Hawaii USA. It is HALAL and Kosher certified product and has been produced under international GMP guidelines. Omega 3 capsules are 100% natural and safe product recommended to be used for all age groups. It contains a blend of fish oil, EPA (Eicosapentaenoic Acid), DHA (Docosahexaenoic Acid), Vitamin E (d-Alpha Tocopheryl Acetate) with supporting Nutrients like Lycium Fruit, Acai Fruit Extract, Noni Fruit (Morinda Citrifolia), Pomegranate. These herbs and fish oil is a rich source of omega 3 fatty acids. It is a unique product that provides minerals, trace minerals and vitamins to the body. Kevital capsules may help to fight fatigue and keep you energetic and mentally alert throughout the day, improve health and stamina. It may also be beneficial for controlling diabetes and for healthy heart, bones, teeth, skin, hair, nervous system. We have launched an excellent product named as L-Arginine that is an essential acid, the building blocks of protein. It is required for the body to synthesize nitric oxide, which enables the arterial system to retain its youthful elasticity. It is HALAL and KOSHER Certified product and produced under International GMP guidelines. L-Arginine capsules may help to promote natural growth hormone release from the pituitary gland which may promote healthy anabolic metabolism throughout the body, helping to maintain protein synthesis within cells and support immune system. We have launched a unique product named as Garcinia Capsules which is a HALAL & KOSHER certified product & produced under International GMP guidelines. It has been formulated in technical collaboration with Hawaiian Herbals located in Hawaii, USA. It is a 100 % natural product produced under international GMP guidelines. This formula uses the finest quality Garcinia Cambogia Extract which helps in weight loss. Mushroom Mix Capsules is one of the most popular nutritional products in the world, and is launched in technical collaboration with Hawaiian herbals, Hawaii, USA. This is HALAL & Kosher acclaimed product and produced under GMP guidelines. This product promotes general good health and vitality. It also has a harmonizing effect on the body and helps maintain body balance. It contains potent antioxidants. Antioxidants neutralize the oxidant effect of free radicals of normal cellular respiration and metabolism. It improves blood circulations and boosts immune system. Here to brief you about one of our new launch in Healthcare Range – Bioprotectant which is introduced from Hawaiian Herbals, Hawaii, USA. This is 100% natural product and has been produced under International GMP guidelines. Moreover this is HALAL & Kosher Certified valued product. This Bioprotectant is a proprietary blend of life enhancing ingredients which not only extinguishes harmful free radicals but also prevents the accumulation & formation in the body. These ingredients are scientifically proved to be helpful in prevention of a number of degenerative, age-related disease like cancer, cardiovascular disease, Cognitive Impairment, Immune dysfunction, Alzheimer’s, skin related problems etc. Kidney Care Capsule is very effective products first time launched in India in joint venture with Hawaiian Herbals, Hawaii, USA. This product is HALAL & Kosher certified and has been produced under international GMP guidelines. Kidney Care is sourced from the highest-quality herbs and concentrated by 100% natural processes. These are formulated using natural extracts of various medicinal plants and are highly admired for side effect free feature. Kidney Care supports healthy urinary function, kidney function and efficiency, and helps maintain a normal balance of fluids in body. Cow Colostrum is manufactured in the most technologically - advanced Colostrum production facility in the world. This is 100% natural product & produced under GMP guidelines. This is HALAL & Kosher acclaimed product. Research has shown that colostrum collected and manufactured using approved process is a safe and effective health product.